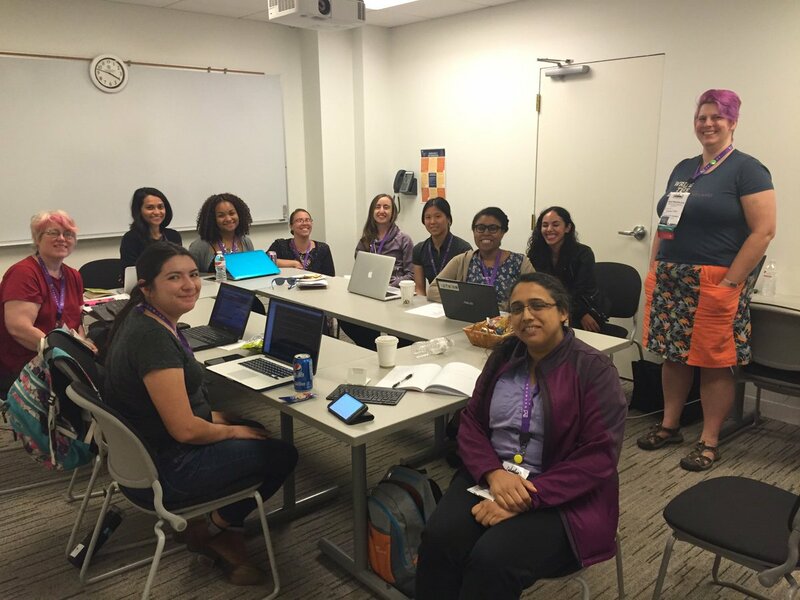 This week I was at Write/Speak/Code, a conference designed to teach technical women how to excel in other parts of their careers. It was amazing, soul-filling, and sometimes painfully honest. I was asked to mentor a group of nine women for Speak Day. We had a couple hours for them to write and deliver lightning talks. A lightning talk is a very short talk, usually about 5 minutes long. They are an excellent way to get a taste of conference speaking without needing to do a full talk proposal. They’re the gateway drug of standing on the big stage with a mic. Lightning talks are not limited to strictly technical topics. I have seen amazing lightning talks on printing presses, homebrewing, arduino, and Minecraft, as well as more conventional topics. I always pick talk topics based on something I’m angry about. I find that’s a good place for me to find the energy to drive a speaking project forward. Creating your title slide helps you break the fear of a blank page. Always include your name. I also strongly recommend you include a way to get in touch with you, if someone has questions or job offers later. In this example, I used my Twitter handle. I also gave people a hashtag that they could use to tweet about the talk. This is an innovation I’ve been trying to spread for about 6 months and it appears to be working. Yay! It makes it much easier to Storify tweets about the talk if there is a unique hashtag. I’ve added my handle and the hashtag to all my master pages, so that they appear on every slide. It’s really annoying when you go to tweet someone’s amazing insight and it’s 20 slides after their intro and you can’t remember their handle. Yes, really, this is the next step. If you only have 5 minutes, you must have a punchy conclusion. If you write it first, then all your other writing will lead to it. What are you angry about? What do you want to prove? What do you want to show people? What do you want to teach them? This is essentially the same as the thesis paragraph in your five paragraph essay that you wrote in elementary school. Make sure your thesis is short. A long thesis means you have chosen too complicated a topic and you’ll run over time. I think my favorite thesis/title from this group was “Passwords Are Terrible”. Thesis Example: Teaching children to wash dishes is like writing automation scripts. Unlike the five paragraph essay format, we’re not doing three paragraphs of supporting detail. Instead, I suggest using thesis-anithesis-synthesis. In this model, your thesis is followed by objections that could be made to it, or problems that are likely to occur in implementation. Antithesis example: Children are less reliable than computers, and they also don’t have good chron scheduling. Reconciling your thesis and antithesis is deeply satisfying. You can bring them together in the common areas, and explain how you would get around the problems brought up in the antithesis section. Writing this section is like creating your own plot twist. Synthesis example: Although both automation and teaching children to wash dishes have initial startup costs higher than the task, investing in them saves you work in the long run. You still need to kick off the process manually, though. I always practice my talks first by muttering through the slides, and then by asking people I trust to give me feedback. There is not always time to do this for lightning talks, but try to practice it if you can. You MUST come in under time, because people will cut you off. There is no mercy for lightning talks that run long. All the lightning talks I’m used to are given from a single computer run by the conference. You send a link or file of your slides and it’s not run on your computer. You may or may not have a presentation remote to advance your slides. Some conferences only let you have one slide, or don’t use slides at all. That’s ok, you can still write out the talk, you just can’t get distracted looking up corgi pictures. You will have a handheld mic, if anything. It takes too much time to set up the other kinds. Have fun! Lightning talks a great way to get used to speaking in front of crowds without having the full-on nervousness. Nothing can go THAT wrong in five minutes. Here is my great group!